Being the rarest in the world is great if you are a stamp or coin, but if you are an animal, the distinction is far less sought after. 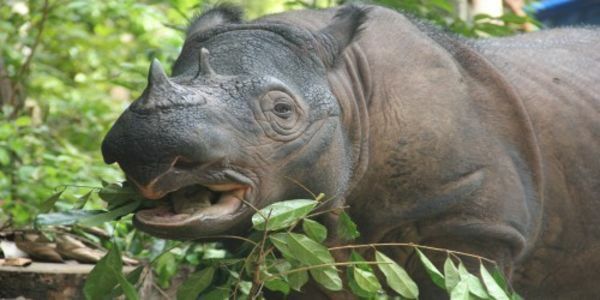 Unfortunately, the Sumatran rhino, is just that, one of the rarest rhino species in the world. With fewer than 100 living in the wild. The smallest of the rhino family - vocal and hairy - the pachyderm can only be found in a few spots of dense forest in Indonesia, Malaysia and possibly even Myanmar. And just like their African cousins, their hard growth horns - despite being significantly smaller than those of their western counterparts - have been their downfall. They are used in Chinese medicine and as ornamental dagger handles in the Middle east. As of mid 2017, conservation groups have been in agreement as to what needs to be done to save them from certain extinction. A full-blown concerted effort to increase captive-breeding efforts, but despite being one of the nation's iconic creatures, the government seems to be dragging its feet to help get the ball rolling. Conservationists have cited various reasons why efforts have stalled including red tape, nonsensical arbitrary decisions and territorial squabbling. Even the most basic measures to protect the species like on-the-ground protection from rangers, have been frustrated. Yet all the while the chance that the rhino will disappear becomes more and more likely. If theses beautiful creatures are to be saved, government, not just conservationists must act and help assist in any plans that could bring them back from the edge of extinction. However, six months after the decision was made to implement a capture and captive breeding program, the government has not lifted a finger. It is imperative the Indonesian government act now to assist conservationist in their effort to save the Sumatran rhino. Any more delays puts their future in jeopardy. Please sign the petition and tell Indonesian President Joko "Jokowi" Widodo to take action now and help in the efforts to implement the rhino's last chance at survival - the captive-breeding program.